Archaebacteria and eubacteria are two domains of the kingdom: Monera, which contains the least organized unicellular prokaryotic microorganisms on earth. Both archaebacteria and eubacteria are single-celled microorganisms, which are usually called prokaryotes. The main difference between archaebacteria and eubacteria is that archaebacteria are usually found in extreme environmental conditions whereas eubacteria are found everywhere on earth. Archaebacteria are the single-celled microorganisms, living in extreme environments. They form a domain of kingdom monera. Archebacteria are considered to be evolved just after the first life on earth. Hence, they are called ancient bacteria. Archaebacteria are found in hot springs, salt lakes, oceans, marshlands and soils. They are also found in human skin, oral cavity and colon as well. Archaebacteria play a vital role in carbon cycle and nitrogen cycle. Their pathogenic or parasitic effect is still not observed. Archaebacteria are metabolically diverse, using a variety of substrates as their energy and carbon sources. Asexual reproduction of archaebacteria is identified, occurring by binary fission, budding and fragmentation. Individual archaebacterium is 0.1-15 μm in diameter. Different shapes are processed by archaebacteria like spheres, rods, plates and spirals. Some cells are flat or square-shaped. The cell wall of archaebacteria is made up of pseudo peptidoglycans. The membrane lipids of archaebacteria are ether-linked, branched aliphatic chains, containing D-glycerol phosphates. According to the structure of cell wall, archaebacteria are more similar to gram positive bacteria. Archaebacterial genome consists of a single circular chromosome, which exhibits transcription and translation similar to eukaryotes. Three types of archaebacteria are found: methanogens, halophiles and thermophiles. Methanogens are found in oxygen-free environments like marshes, lake sediments and digestive tracts of animals, producing methane gas. Halophiles live in water with high concentrations of salts. Thermophiles live in hot water environments in acid sulfur springs. Archaebacteria is shown in figure 1. Eubacteria are a more complex domain of kingdom monera. They are found in most of the habitats on earth like soil, water and inside or outside of large organisms. Since eubacteria do not consist of membrane-bound organelles, almost all the metabolic reactions take place in the cytoplasm. Some eubacteria are involved in the nitrogen cycle as well. They also exhibit both parasitic and pathogenic effects on their host organisms. Other than usual asexual reproduction methods, eubacteria exhibit sexual reproduction methods like conjugation. Individual eubacterium is 0.5-5 μm in diameter. Eubacteria exhibit a variety of shapes and arrangements. Cocci and bacilli are the major shapes. Vibrio, rods, filaments and spirochetes are the other shapes of eubacteria. Membrane lipids of eubacteria are ester-linked, straight chains of fatty acids, containing L-glycerol phosphates. Eubacteria consists of a single circular chromosome in their cytoplasm. Depending on the cell wall thickness, eubacteria can be divided into two categories: gram positive and gram negative bacteria. The peptidoglycan layer of gram positive bacteria binds with the gram stain, giving positive results. The cell wall structure of gram negative bacteria is more complex than gram positive bacterial cell wall and incapable of binding with gram stain. Eubacteria are shown in figure 2. Archaebacteria: Archaebacteria are called ancient bacteria. Eubacteria: Eubacteria are called true bacteria. Archaebacteria: Individual archaebacterium is 0.1-15 μm in diameter. Eubacteria: Individual eubacterium is 0.5-5 μm in diameter. Archaebacteria: Archaebacteria are spheres, rods, plates, spiral, flat or square-shaped. Eubacteria: Eubacteria are cocci, bacilli, vibrio, rods, filaments or spirochetes in shape. Archaebacteria: Archaebacteria are simple in their organization. Eubacteria: Eubacteria are more complex than archaebacteria. Archaebacteria: Archaebacteria are found in extreme environments. 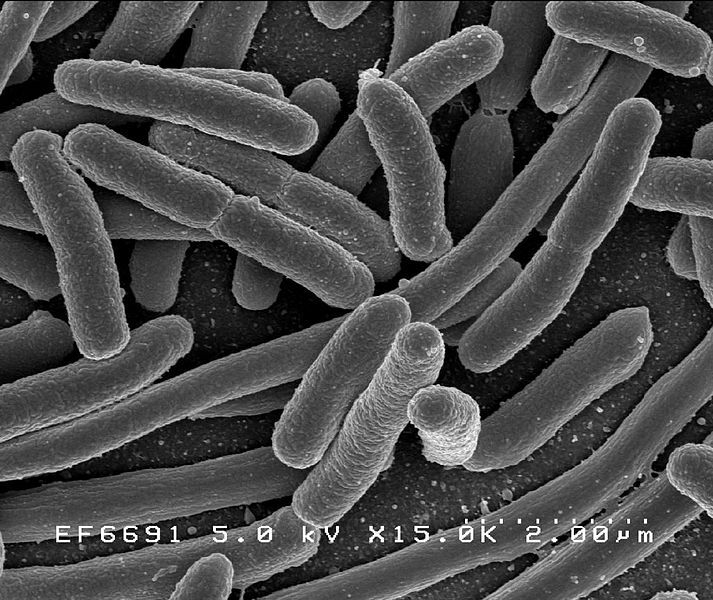 Eubacteria: Eubacteria are found everywhere on earth. Archaebacteria: Cell wall is composed of pseudo peptidoglycans. Eubacteria: Cell wall is composed of peptidoglycans with muramic acid. Archaebacteria: Membrane lipids of archaebacteria is ether-linked, branched, aliphatic chains, containing D-glycerol phosphate. Eubacteria: Membrane lipids of eubacteria are ester-linked, straight chains of fatty acids, containing L-glycerol phosphates. Archaebacteria: RNA polymerase of archaebacteria consists of a complex subunit pattern, which is similar to eukaryotic RNA polymerase. Eubacteria: RNA polymerase of eubacteria consists of a simple subunit pattern. Archaebacteria: No thymine is present in the TψC arm of the tRNA, carrying methionine. Eubacteria: Thymine is present in most of the tRNA, carrying N-formyl methionine. Archaebacteria: Introns are present in archaebacteria. Eubacteria: Introns are absent in eubacteria. Archaebacteria: Asexual reproduction methods like binary fission, budding and fragmentation are used by archaebacteria during their reproduction. Eubacteria: Other than binary fission, budding and fragmentation, eubacteria are capable of producing spores in order to remain dormant during unfavorable conditions. Archaebacteria: Archaebacteria exhibit neither glycolysis nor Kreb’s cycle. Eubacteria: Eubacteria exhibit both glycolysis and Kreb’s cycle. Archaebacteria: Archaebacteria are three types: methanogens, halophiles and thermophiles. Eubacteria: Eubacteria are two types: gram positive and gram negative. Archaebacteria: Halobacterium, Lokiarchaeum, Thermoproteus, Pyrobaculum, Thermoplasma and Ferroplasma are the examples of archaebacteria. Eubacteria: Mycobacteria, Bacillus, Sporohalobacter, Clostridium and Anaerobacter are the examples of eubacteria. Archaebacteria, eubacteria and cyanobacteria are the three domains of kingdom monera. Archaebacteria are called ancient bacteria whereas the eubacteria are called true bacteria. Eubacteria are usually found in soil, water, living in and on of large organisms. Eubacteria are divided into two groups known as gram positive and gram negative bacteria. Archaebacteria are found in salt brines, ocean depths and hot springs. They have evolved just after the evolution of first life on earth. Three types of archaebacteria are found: methanogens, halophiles and thermoacidophiles. The main difference between archaebacteria and eubacteria is their habitats in the environment. Esko, Jeffrey D. “Eubacteria and Archaea.” Essentials of Glycobiology. 2nd edition. U.S. National Library of Medicine, 01 Jan. 1970. Web. 18 Apr. 2017. “Kingdom Archaebacteria – Six Kingdoms.” Google Sites. N.p., n.d. Web. 18 Apr. 2017. Eubacteria. N.p., n.d. Web. 18 Apr. 2017. <http://faculty.college-prep.org/~bernie/sciproject/project/Kingdoms/Bacteria3/eubacteria.htm>.